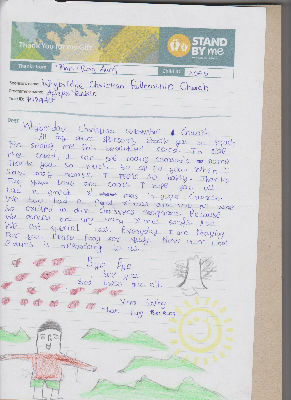 Than is a young lad that we, as a church, sponsor through Stand by Me (formerly Kids Alive). He lives in Agape, Burma. He lives in an orphanage after his grandmother could no longer look after him. He goes regularly to school and enjoys studying. He passes every examination in every month. 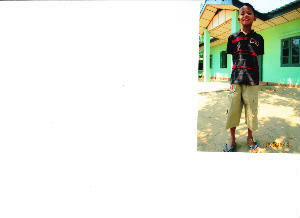 He loves to learn bible stories and can recite some not only in Burmese but in English too. His hobbies are watching movies and drawing. Among the sports he loves to play football. Than attends the Sunday School class each week. He is a talkative boy and has a good relationship with other friends but is a little shy to talk with others first. Most of the time he mingles with those who are younger than him. He has good communication with the staff. He has been attending the Bible Camp during the school holiday, and is never absent for daily devotions and prays a lot. He is interested in the life of King David and he is eager to listen to the Bible story. He is growing in his spiritual life. We write to him regularly and he always replies. My dear sponsor, I hope you doing well. I am doing good here. This time I wanna wish you Happy Summer Time. Now we are in too hot season. Myanmar people they have water festival during this summer time. They played with water and they were really happy. But we don't join with them. During water festival I was so happy with our bible camp. Because I learn. Many people they came to our campus. What do you usually do?I miss you all. God bless you, your loving son Than Tung Aung. On behalf of Than I would like to express my huge thanks and appreciation for all you are doing in transforming his life. I cannot express just how much your support means to him. Your contribution as a child sponsor is far more than financial, as through correspondence you are playing a key role in giving your child a sense of self worth, emotional support and a belonging. 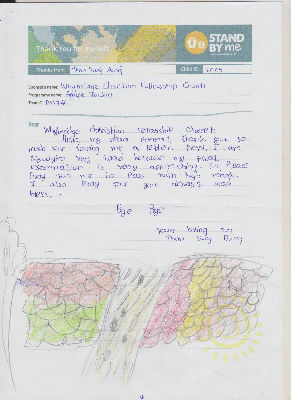 Our children around the world love to hear from their sponsors and often letters, cards and photographs are stored under their pillow and are treasured for years. Your correspondence is a real symbol to them that they are loved, valued and cared for. The children love to hear all about you, your family and culture and are eager to learn about new things. Thank you for all you are doing and for your support of Stand by Me, you really are making a difference in your child's life. 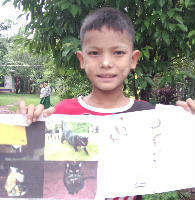 My dear sponsor, thank you so much for sending me the story of Butterfly, some beautiful animals photos and letter.When I heard the story of these animals, I feel so happy to hear again and again. I don't understand and cannot read. But my elder brother Mr Kampi translated for me. Thanks for remembering now we are in rainy season and everywhere there is full of water. I hope yhou all are doing well. Please pray for my study. Thank you so much for sending me a beautiful birthday card and so many stickers. I love them very much. When I received them I feel so excited. Thanks again for remembering me. May you please continue to pray for my examination. May God bless you all.